Taking your frozen or homemade pizza game to the next level is simpler than you’d think: just add a pizza stone! You can get amazing authentic results without investing in a brick pizza oven--no more soggy bottoms! Our pizza stone reviews summarize the results of our research of a range of products to help you find the best option for you and your kitchen. Before you dive into the reviews, check out these pizza stone features to consider during your search! Dimensions: How big is it? From petite 13’’ diameters to larger rectangular stones, you can cook a little or a lot! Shape: The main pizza stone shape options are round and rectangular. Your preferences determine the best option! Cooking Use: Some pizza stones are best suited for the oven, but a lot of them can be used on the grill as well! Material: Common materials for pizza stones include stone, ceramic, and glazed ceramic, each with different features. Accessories: Some pizza stones come with handy extras like cutters or serving racks, adding value to your purchase! Weight: How heavy is it? Although heavier stones can be more durable, they can also be harder to use and move. Anyone else having a sudden craving for pizza? Quick, let’s get through the reviews! Our top pick and budget pick provide two amazing options, but our pizza stone review doesn’t stop there. Keep reading to compare all of your options, then go buy some pepperoni! Our top pick among the best pizza stones is the Old Stone Pizza Stone. Made from lead-free clays and cordierite, this pizza stone is made in the USA and highly temperature resistant. Use it on the grill or in the oven for better pizza and other baked goods! Its rectangular shape makes it easy to maneuver, and you don’t have to try to make a perfectly round pizza to fit. It has a solid .8’’ thickness that adds durability to help it provide you with many, many delicious pizzas! It doesn’t crack when exposed to temperature changes and can withstand temperatures of up to 2000 degrees. That makes it safe to use in just about any oven or grill setup. Like many pizza stones, it should be hand washed without soap and will naturally discolor over time when exposed to oils and other ingredients. It’s the top rated pizza stone of choice for tons of pizza masters! ThermaBond cordierite provides a boost of high-temperature tolerance and thermal shock resistance to this rectangular pizza stone. The large 20’’ by 13.5’’ size makes this our pick for the best pizza stone for oven use that won’t break the bank! The 20’’ width fits in most standard ovens and allows you to cook up two pizzas at once, one big pizza, or a big batch of cookies or biscuits! It can also be used on the grill but might be a little wide for some smaller grill types. Rectangular pizza stones tend to be easier to grip and handle than round stones while giving you more space to work with. Plus, no need to worry about making a perfectly round pizza from scratch! This stone should be hand rinsed without soap for best results. If you’re worried about its size and weight, check out some of the lighter and smaller pizza stones we’ve reviewed below! The Solido Pizza Stone is a rectangular masterpiece that’s easy for you to handle while providing a large surface area for you to work with. It’s made from cordierite stone for a high level of heat tolerance and thermal shock resistance--so you can use it on the grill or in the oven without fear! It features a Heat Spiral base designed to improve the heating process for even cooking. It also has base feet to raise it slightly from the cooking surface, making it easier to grasp and transport in and out of the oven. The stone thickness is .75’’ and the 14’’ by 16’’ surface area gives you more room to work with than typical round pizza stones. It should be hand washed without soap to continue getting the best-tasting results. It’s one of the best pizza stones for oven use thanks to the little feet and the Heat Spiral! Do you want a pizza stone that’s more than just a flat slab? The Love This Kitchen Ultimate Pizza Stone has a lot to offer! Made from ThermaShock cordierite stone that’s highly heat resistant, it has a shaped convection-effect base and anti-spill rim. The base is shaped to direct heat towards the center of the stone and has divots to give you a better grip. The anti-spill rim keeps your pizza from sliding off the stone as you remove it from the oven. 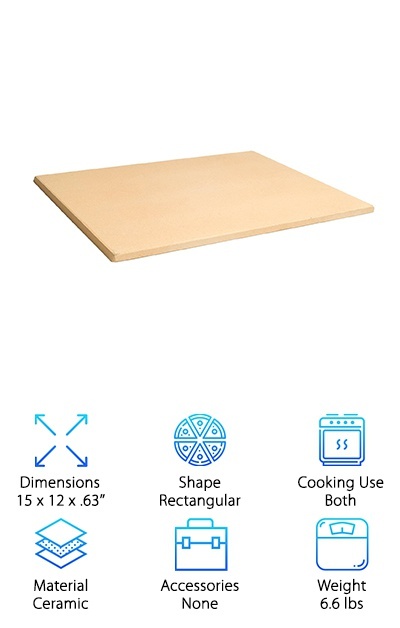 It’s also thicker than the average pizza stone at .8’’ and gives you a broad 14’’ by 16’’ rectangular space to work with. This pizza stone comes with an instruction manual, online video tutorial, and free ebook of over 100 recipes! If you’re looking for a high-quality rectangular pizza stone that works with you, not against you, the Ultimate pizza stone from Love This Kitchen is your new best friend. 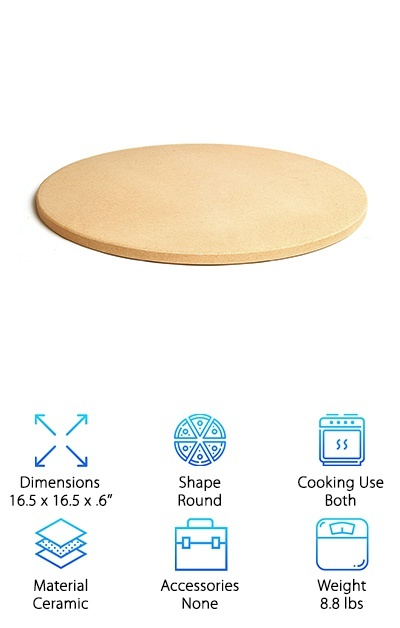 The Unicook Heavy Duty pizza stone is made from cordierite stone, a ceramic material known for its high thermal shock resistance and ability to withstand high temperatures without cracking. This rectangular pizza stone may be easier to grasp and move around than round stones. You’ll have plenty of room to maneuver around your pizza without getting sauce on your oven mitts! It measures 15’’ by 12’’ and is about .6’’ thick. It feels sturdy and tough thanks to its 6.6-pound weight. 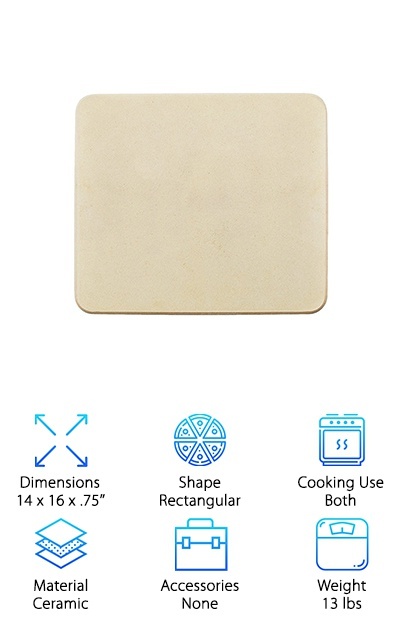 This rectangular pizza stone should be rinsed by hand without using soap and can be used in the oven or on the grill. 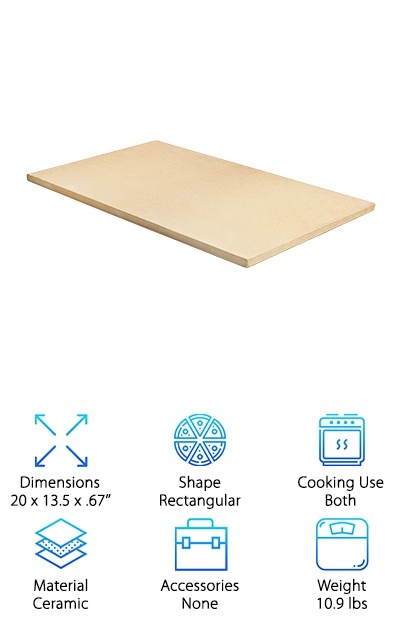 The manufacturer does not recommend cutting your fresh-made pizza on the stone itself, even though it looks like a cutting board! The high-temperature tolerance and easy to use rectangular shape makes this a top choice for the best pizza stone for grill use. 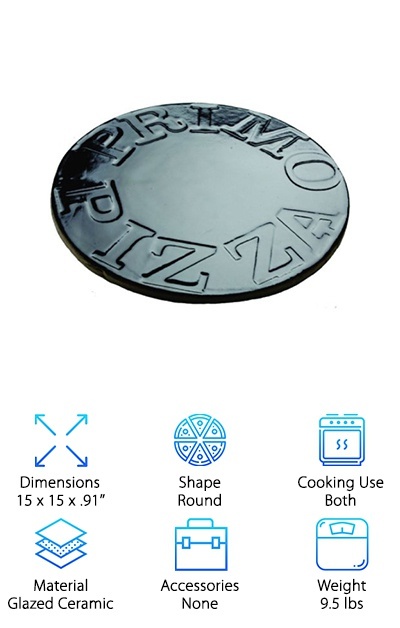 The Wilton Pizza Stone is a round pizza stone made from stoneware that comes with a convenient chrome-plated rack to transport the pizza stone (and your tasty pizza) from oven to table. This pizza stone has been used in the oven and the grill but seems best suited to the more controlled temperatures of the oven. Like all unglazed pizza stones, it will discolor over time as it is exposed to oil and other ingredients. It has a slightly larger size than the typical 13-14’’ diameter stones and a good weight at almost six pounds. You can also use it to bake breads, biscuits, and more, so it’s a great multi-tasking kitchen tool! It also retains heat so your remaining pizza will stay warm throughout the meal. This stoneware pizza stone is a great option for better oven-baked pizza results with a low price! Made from cordierite stone, this round Pizzacraft pizza stone features thermal shock-resistant ThermaBond technology. It’s very durable, natural and FDA-safe, and requires no seasoning or conditioning. 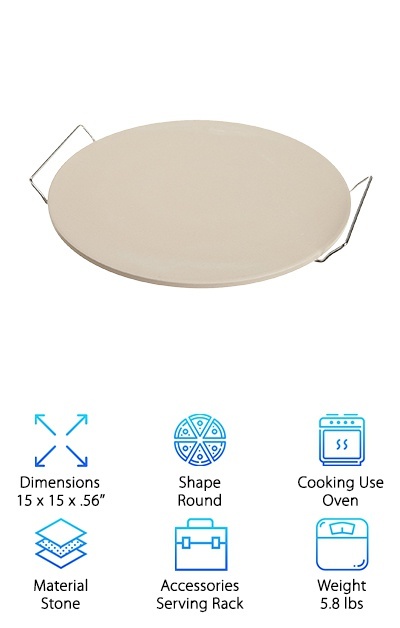 It has a large 16.5’’ diameter that may be a good option for people who like to make big pizzas. It’s a heavy-duty stone at almost nine pounds, but unfortunately, it’s not dishwasher-safe. The stone can also be used for even browning of biscuits, cookies, and more! It can be used on the grill or in the oven. Lay down some cornmeal or a sheet of parchment paper to cut down on cleanup time and sticking. It’s thick for extra durability to help it resist cracking. Just avoid using soap on it and it will last for years. The price isn’t half bad, either! If you’re looking for the best pizza stone for making large pizzas, take a look at this option from Pizzacraft! This lightweight pizza stone from Cuisinart is made from cordierite, a stone-like material that is more resistant to thermal shock than ceramic--it won’t crack in extreme heat or cold. It can be used on any grill or in the oven, and you can cut the pizza right on the stone. Then, toss it into the dishwasher! Cleanup is a breeze compared to more common hand-wash stones. 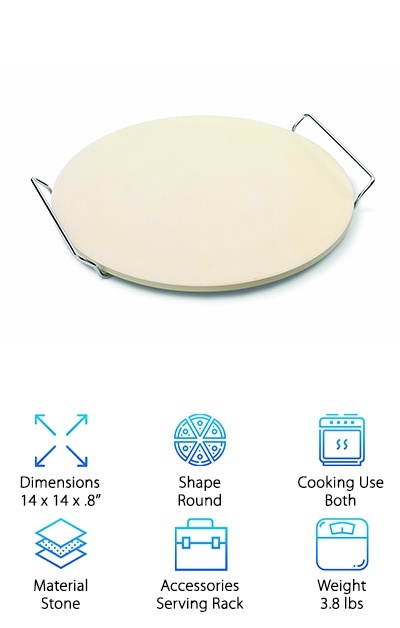 This round pizza stone has a 13’’ diameter and is .4’’ thick. 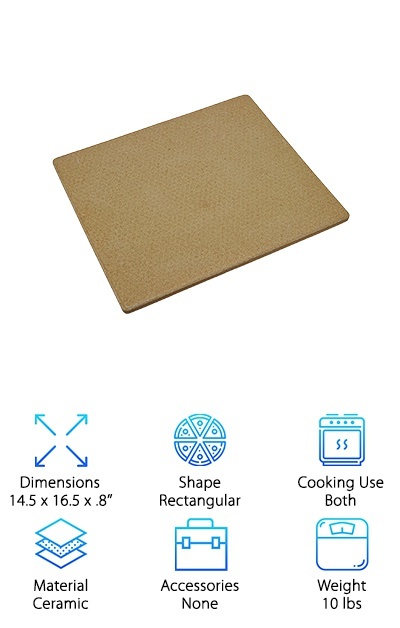 It’s also lightweight at under two pounds, so it’s a great option if you find ceramic and earthenware pizza stones too heavy to cook with easily. If you want a mid-range pizza stone for pizza, calzones, and other baked or grilled goods, this Cuisinart option is ultra-convenient. No need to scrub it in the sink by hand after you’re done cooking: your trusty dishwasher will do the work for you! This glossy black ceramic baking stone is coated with a nonstick porcelain glaze finish for fast and easy cleanup. A glazed pizza stone is a great choice for people who like a professional look that won’t stain and is easy to clean. You can use this pizza stone on the grill or in the oven for amazing authentic pizza texture every time! 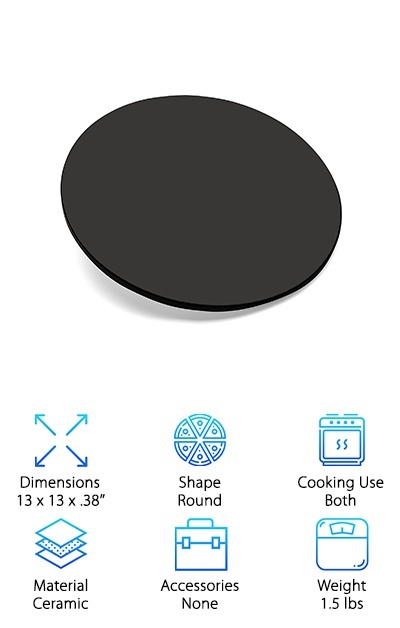 The thickness of this ceramic pizza stone helps it stand up to high heat and consistent use over time, giving it added durability and strength compared to thinner pizza stones. You can also use it with a Primo or Green Egg-style smoker and to make crispy open-face sandwiches and more! This is a premium pizza stone that grill masters and lovers of Italian food will love. This is definitely one of the best pizza stone options for people who love a professional, clean look to their cookware! This earthenware pizza stone from Jamie Oliver keeps it simple with an included pizza stone, serving rack, and recipe booklet. The clay pizza stone needs to be tempered in the oven before use, and then you can use it on the grill or in the oven for tasty pizza with a crispy crust! The clay material absorbs moisture to help you avoid a sad, soggy base. The stone measures about 14’’ across and easily goes from oven to table thanks to the included metal serving rack. You can also use it to bake bread and biscuits. If you love all things Jamie Oliver or just want an inexpensive traditional pizza stone, this product is a great option! Keep in mind that this stone is hand wash only and that oil and other ingredients can stain it. 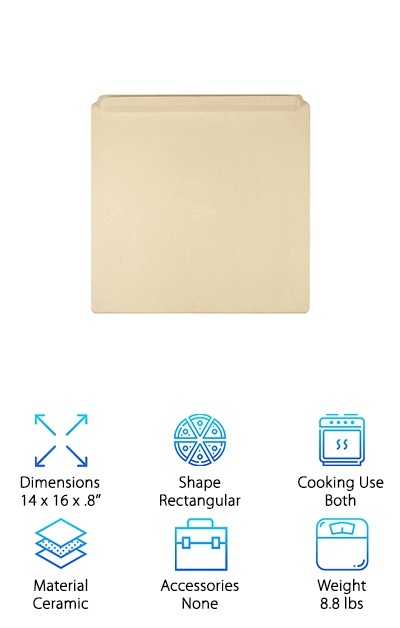 Whether you make pizza fresh or from frozen, you can get better results with this clay pizza stone!